This issue takes place overseas so get your passports ready as we head into the fictitious homeland of the Silver Sable, Symkaria! Where the fighting doesn't wait not one second. After a good beat down, turns out all Sable and Spidey stopped was a regular robbery. Back at the castle of the royal family, everyone's getting ready for a big celebration. They're celebrating the anniversary of the royal bloodline staying in power, but also the king is having a baby which means the bloodline will continue. 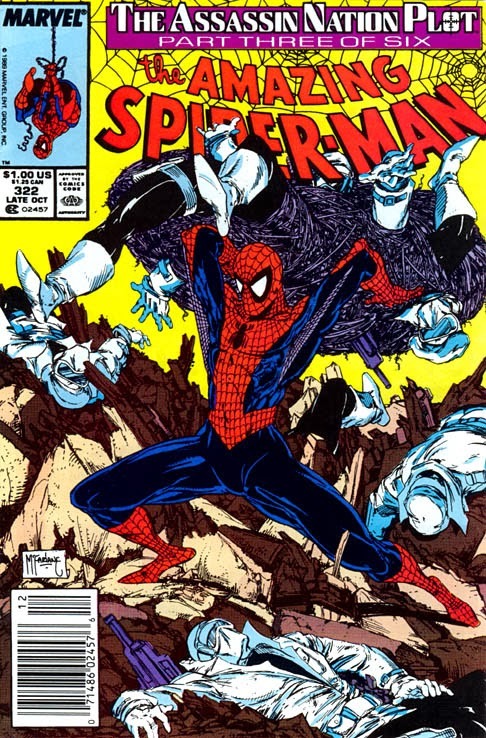 Before they part ways, Spidey and Sable meet up with the country's prime minister Limka. He seems a bit sketchy, and his intelligence team hasn't helped Sables cause too much. Sable decides to stay with the king, so Spidey takes this time to do some investigating the only way he knows how. Sketchy was an understatement to describe the prime minister, as he's alone we see him talking to an Ultimatum Soldier. These guys are bad, keep that in mind. Limka wants to kill off the king and his baby momma to be, so that he can begin to push the country into a more heavy democracy, with him at the helm. Back home all seems to be going well, MJ went for an audition for a soap opera and she takes a big chance on it, talking to her judges in character basically telling them off. It was a page used perfectly for comedic relief. Now back to the action...and more slight comedic relief. At the royal gala (celebration...I think) Spidey is dressed to kill in his suit...and in a tuxedo suit! Since he can't technically be Parker in this country, too many questions. He has to be Spidey the whole way through. The night ends and early in the morning both Spider-Man and Silver Sable keep close watch over the festivities. A bunch of planes come roaring over the crowd and a couple parachuted men jump out. Nothing too spectacular, until those men start shooting into the crowd! All hell breaks loose and it breaks quick! The Ultimatum Soldiers burst into the castle, searching for the king while Spidey and Sable act fast to protect everyone they can. Elsewhere, prime minister Limka is overseeing the slaughter, happy. The Ultimatum Soldiers were nothing but a distraction for the REAL plot. But before he can even put that into play, a shadowed beast who's silhouette looks a lot like a hairy familiar hero, lunges at him and kills him gruesomely. At the same time, a soldiers manages to find the kings wife and fills her with bullets, causes Sable to lose it and shoot him and another soldier straight out the window. Everything is now as calm as it can get. Hundreds of questions, barely any answers. One of the guards of the castle brings Sable and Spider-Man upstairs to where prime minister Limka was murdered. Apparently, his killer's clothes were snagged on something and he left behind a small capsule. The color of the capsule and the aroma tell the Silver Sable one small detail, but this detail is a huge deal in her eyes, it matches the capsules given to all C.I.A. agents for their missions. The U.S. Government has something to do with this here today. And with that, ends another thrilling issue of the Amazing Spider-Man. What a way to end it too right?! Talk about cliffhanger...again! Another exceptional issue out of this Michelinie/McFarlane omnibus. Be back in another week for part 4 of 6 of this Assassin Nation Plot! Who lives?! Who dies?!?! Find out in a week!